Licensed Educational Psychologist (California BBSE Lic. # 2193) Laguna Beach, Ca. 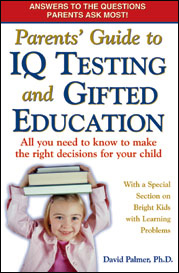 My book has helped thousands of parents understand gifted testing and programming so that they can better work with the schools to find the right program for their child. Dr. Palmer is Licensed Educational Psychologist, award winning researcher, university lecturer, and frequent presenter at local, state, and national events. 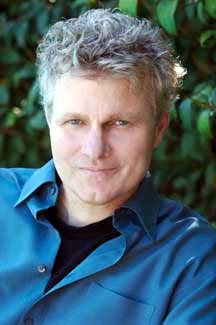 Dr. Palmer was recently featured as a commentator on the Discovery Health Channel's "My Kid's Smarter than Me"
Private Testing for Giftedness? If and When. Would Your Child Benefit From A Grade Adjustment? "Thank you again for your insight. You have been a tremendous help to us." "Thanks to you we feel very informed and able to advocate for our daughter's best interests"
"...answers a lot of questions about our child's nature, mind, and personality." "So interesting... thanks so much!" "You’ve really helped us understand our options... thank you." Many bright kids have specific learning or processing problems that impede their ability to learn up to their potential. Many of these kids can be helped tremendously by proper evaluation and timely remediation. Other kids with specific learning disabilities may need accommodations in school or on state testing or SAT exams. I have 20 + years of experience in the in this field, have trained other psychologists in learning disability assessment at the university graduate level, and understand what specific assessments to use to obtain the most valid and useful information. Through these assessments I have helped hundreds of children, teens, and adults find the support they need to succeed. Learning disability assessment includes a comprehensive IQ assessment, a comprehensive achievement assessment, and several supplemental assessments designed to look more closely at areas like memory, speed of processing, attention, visual perceptual abilities, and auditory processing (specific supplementary tests vary according to individual situation). A learning disability assessment can usually be completed in 3 sessions. Contact me if you would like more information. Note: Characteristics of giftedness can sometimes be misinterpreted as symptoms of ADHD, a behavioral or emotional disorder, or even a form of autism. Although gifted children can certainly have these conditions, differentiating between gifted behaviors and the traits associated with such disorders can be tricky. The more information you and others have about your child's development, the better position you are in to identify the underlying causes behind any unusual behaviors. Contact me via email at dave@palmerlearning.com (preferred), or by phone at (949) 892 9805 or (562) 743 9520 for more information or to arrange an appointment. I will respond via email or phone usually within one day. I am currently booking weekend appointments.